Because most plain sewing items (at least those I study and collect) are white, I confess I sometimes get weary of plain white! I love the variety of early cotton prints, the charming patterns and colors. Children’s dresses from the early 1800s are a good example of garments that could be very simple to make with only plain sewing skills. In fact, there is a very early book called Instructions for Cutting Out Apparel for the Poor; Principally Intended for the Assistance of Patronesses of Sunday Schools and Other Charitable Institutions, but Useful in All Families that describes the process. For those who would like more detail and patterns that they can easily use today, there is another book, The Lady’s Economical Assistant, which has been reproduced after the 1808 edition, available from Kannick’s Korner. I came across this one day while surfing for children’s print dresses. 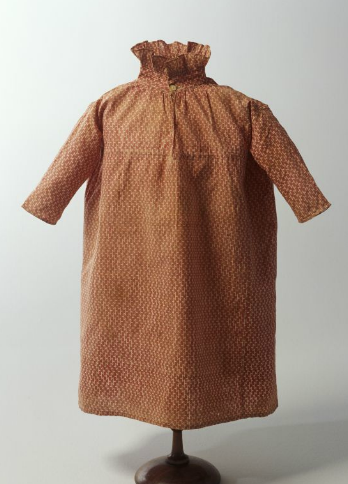 It is a simple child’s gown dating to 1803 that has a story, one I could never imagine. Made of a shabby, sweet calico print, it is typical for its day: simple in cut, with a little frill around the high collar. The tragedy lies in the last day it was worn. John Marsden was two years old when he died after being scalded in an accident at home. The Marsden family were among the earliest to arrive from England to live in New South Wales and the Powerhouse Museum website has more information on the family and this collection. This entry was posted in Children's Clothing, Hand Sewing, History and tagged Antique Clothing, Children's Clothing, Hand Sewing, History. Bookmark the permalink.